Four Sand Devils made history last Friday when they wrestled in the first official girls wrestling tournament. Shantell Manymules, Leah Reed, Sharmayne Crank, and Latasha Slim all qualified for the girls state wrestling championship after placing in the Girls Sectional Tournament in late January. The girls’ rules are different than boys. The girls play a version of freestyle wrestling where they get points for a takedown. If they take down their opponent onto her back or quickly flip them onto her back, she is allowed the opportunity to try and pin her. If she fails to get her opponent onto her back the ref stands them back up and go again. The wrestlers are awarded two points for each takedown. The match goes until one of the girls reaches ten points, gets the pin, or time expires. 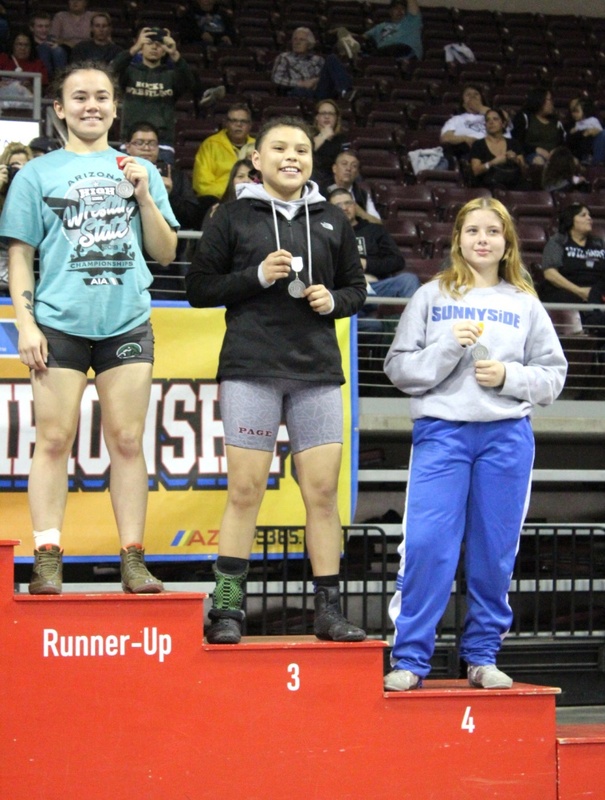 Since this was the first year the Arizona Interscholastic Association (AIA) has instituted girls wrestling there was no team championships, only individual championships. Page wrestlers Sharmayne Crank and Leah Reed were both eliminated in the first round. Shantell Manymules, wrestling in the 118-pound bracket, won her first match winning 6-0 with three takedowns, but she was eliminated in the second round after getting pinned. Latasha Slim earned a third place medal at the event. Slim advanced from the first round after her opponent forfeited, and she pinned her opponent in the second round. Slim lost in the semi-finals 10-0. Slim wrestled Jazmine Lobato from Mohave for third or fourth place during the quarterfinals and beat her soundly. Slim had four takedowns and finished the match with a pin, all within 45 seconds. Slim, who is a sophomore, says she plans to return next year. As the girls wrestling program continues next year Page High School will hire a coach specifically for it, as well as its own practice space.